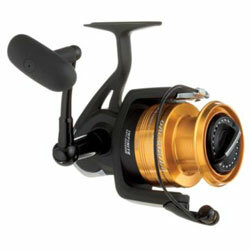 As the name implies, these rugged large-capacity reels assure reliable performance for surf, pier, jetty, or boat use. Equipped with a Soft Touch handle knob; three sealed ball bearings; die-cast aluminum body and rotor; ABS aluminum spool; sealed, multi-disc drag system; machined handle arm; Infinite Anti-Reverse; and TwistBuster technology to help eliminate line problems. "Reel has a good drag but the weight of the reel will wear you out. Not to smooth compare to other Dawai I own."